Achieve instant electronic mastery! This world demands skill with electronics. Familiarity with the basic components can give one a leg up into the core of technology. The future depends on this, so why not cause a little trouble in the process? From harnessing light, to controlling sound, to sensing the world, this book is a step-up from plug and play kits. The pre-engineers who read this book will build advanced electronics projects from scratch, demystifying electrical components in the process. Once this world opens, anything is possible. 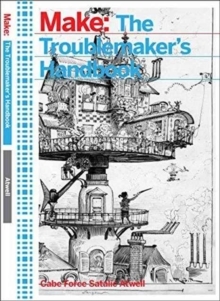 The Troublemaker's Handbook, is a collection of projects making an instant guru of the reader. The projects are some of first a budding electrical engineer should learn, or at least try. The concepts behind these projects can transcend into an adulthood of professional engineering. The book is packed with 100+, projects that will give the reader a resource that can aid them in the future, making just about anything.